Today's agenda for building the Terrace Walls at Ned Wolf Park was the bulk of the heavy lifting. 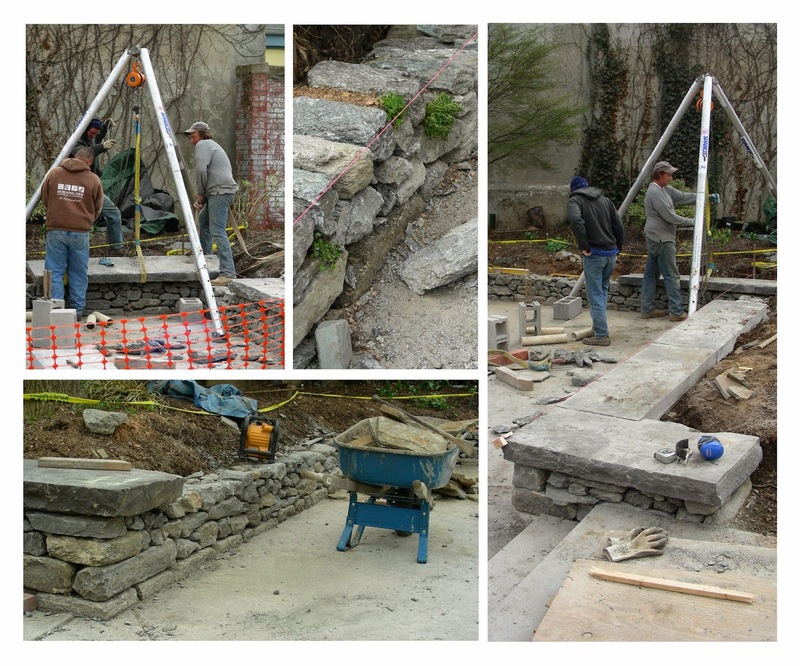 The reclaimed bluestone which averages approximately 4" thick required a tripod lift (top left photo) to hoist these weighty seating capstones into place. But since the schist below varies in height, flagstone slices were inserted as shims to create a level surface. Lots of pre-planning was needed to determine how to best position each of these unique stones. The photo at the right shows the detail at the steps, where a full-width stone was turned perpendicular to the seating surround to create a bold and monumental corner. The photo at bottom left shows that a similar detail was chosen to terminate the other side of the seating wall, which then will continue without a bluestone cap down the sloping walkway to McCallum Street. And the top center photo shows that a few plants are being inserted into the wall as it approaches that sunny McCallum St. sidewalk. Here, we have two slightly different varieties of Campanula: C. porscharskyana and C. portenschlagiana.....commonly known as Serbian and Dalmation Bellflower. To help fund this project, you can scroll down to earlier blog posts or click "Older Posts" to read about the Donor Bricks which will help complete the project funding.